Freitag's innovative designs have been growing in popularity since 1993, when the company launched the first bag to be made entirely from recycled materials. Inspired by the Zurich transport route that passed by their house, design duo Markus and Daniel Freitag began creating bags entirely made from truck tarpaulins, inner tubes and seat belts. Every bag is unique, very durable, easily repairable and waterproof. You can even build your own bag online. You choose what your bag will look like by placing a pattern over a unique tarp (virtually). 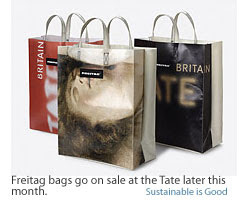 Freitag has also teamed up with the Tate Modern to produce a reusable tote bag made from recycled exhibition banners.